In SharePoint Online, one of the Microsoft Office 365 suite of products, a Document Set allows you to group documents together based on some criteria and then work with the group of documents as a single entity. For example, you may have a project you are working on for marketing and a project you are working on for accounting. You can group your marketing documents together and group your accounting documents together. You can then interact with the accounting or marketing documents as a single group rather than individually. Using Document Sets, you can send all your marketing documents through a workflow in a batch simultaneously or view versioning for all the documents as a set at a given point in time. Click the Site Actions button and then click Site Settings. The Site Settings page appears showing you all the settings for this particular SharePoint site. Go to the Site Collection Administration grouping and click the Site Collection Features link. The features page for this specific Site Collection appears. Click the Activate button next to the Document Sets feature. After the Document Sets feature is activated, you can add the functionality to any library. 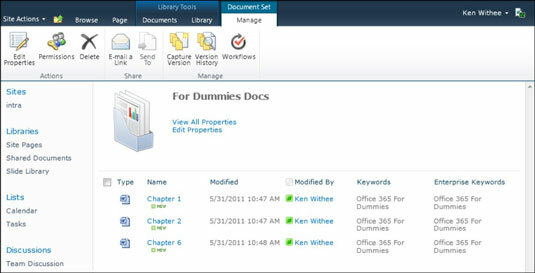 The Document Set takes the form of a Content Type in SharePoint. A Content Type is the grouping of metadata fields into a single group. For example, you may have a recipe that has a content type that includes metadata, such as ingredients, cooking times, and required seasonings. The SharePoint Document Set content type includes all the functionality required to group multiple documents into a single entity. Navigate to the library in which you want to add the Document Sets functionality. Click the Library Settings button located on the Library tab. In order to add a Content Type to this library, you first need to enable editing. On the Library Settings page, click the Advanced Settings link. The Advanced Settings page appears and lets you perform advanced configuration for this library. On the Content Type section, select Yes to allow the editing of content types. Click OK to return to the Library Settings page. Notice that a new section appears on the page now called Content Types. Click the Add from existing site content types link to add an existing site content type. Select the Document Set content type, click the Add button, and then click OK.
Now that the Document Set functionality has been added to the library, you can create a new document set. To create a new Document Set, click on the Documents tab of the Ribbon and then under the New Document drop-down menu, select Document Set. A document set shows up in the Shared Documents library just like another document. You can interact with a document set just like you interact with a single document in the library. The difference, however, is that when you click on a Document Set, you open up the grouping of documents rather than a single document. When the Document Set is opened, a new Document Set tab will appear on the Ribbon. This tab allows you to manage the document set with features, such as editing the properties, changing security permissions, sharing the documents, capturing versions, or pushing all the documents through workflow in a batch.